Karen qualified with honours from Birmingham Dental School in 1983. She spent the next five years specializing in Oral & Maxillofacial surgery at a variety of hospitals including the Queen Elizabeth and Accident Hospitals in Birmingham, and Gloucester Royal and Cheltenham General Hospital. During this time She became a Fellow of Royal College of Surgeons (Edin) in 1986 and gained experience in the fields of oral & maxillofacial surgery, oral medicine, plastic surgery and implantology. She is a member of the Association of Dental Implantology and the British Association of Oral Surgeons. She is also recognised by the GDC as a Specialist in Oral Surgery. Her interests include all aspects of family dentistry with a special interest in surgery and implants in combination with restorative and cosmetic dentistry. 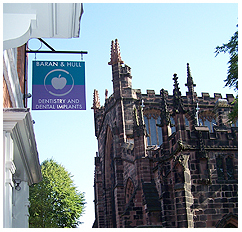 Dr Baran and Karen Hull combined their skills over 20 years ago and set up Baran & Hull Dentistry. Both partners are keen to keep abreast of the new developments in the rapidly advancing field of dentistry and regular attend postgraduate courses both in the UK and abroad.